If you have rheumatoid arthritis or another kind of arthritis — chronic illneses with no cure — it’s highly likely you’ll spend an inordinate amount of time at your rheumatologist’s office. We’re talking about appointments every couple months, at a minimum, for years, decades, even indefinitely. Comfort level: This is perhaps the most important criterion, notes Ashira D. Blazer, MD, instructor of medicine in the division of rheumatology at NYU Langone Medical Center in New York City. I talk to my RA doctor, Dr. Feldman, about everything — arthritis pain, of course, but also diarrhea, menopause, disgusting nose bleeds, and being transgender. Nothing about my health or life is sacred or off-limits because everything is relevant. Admittedly, not everyone has a big pool of rheumatologists to dip into, especially patients in less populated areas. Many have to travel hours just to find a doctor in a 100-mile radius. But if you have the luxury of choice, be picky. This is your health, your life, and your future at stake. Many patients feel rushed in and out of the office, leaving them wondering if their doctors even heard anything they said. 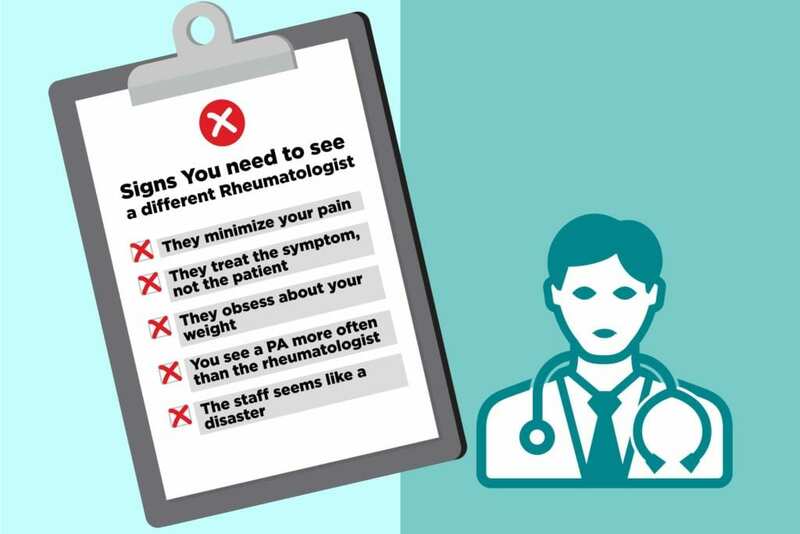 A good rheumatologist will let you talk about every ache and pain, plus the weather (which could be the reason for your pain!). “Mine listens and doesn’t rush me,” says Becki Barnhill. Since a lot of patients get shy or forgetful once they step foot in the doctor’s office, Dr. Blazer recommends bringing a list of concerns and questions to go over with your doctor. If she’s cool going over that list, that’s a good sign. She should also have no problem explaining your lab tests and bloodwork in detail. You should leave your rheumatologist appointment feeling like no stone was left unturned. New technology may mean new norms and ways of communicating for a lot of rheumatologists and their patients. “I have my doctor’s personal cell phone number so if I never need anything, I can call or text her and she always gets back to me right away,” says Layla Tzoras. However, there are many ways your doctors and nurses can show they are able to sympathize with you, and that includes doing everything they can to make sure you have as little pain as possible. If you have a doctor who will stop at nothing to make you feel better, you’ve got the right guy or gal. There should always be another avenue to go down. Failure should not be an option. Debra DeWitt’s rheumatologist keeps track of the tests her other doctors order and “she discusses those results with me, too. She lays out options, then helps me decide what to do.” Mendez appreciates that by the time she comes in the room, her doctor has already read and gone through all of her recent doctor appointments and their notes and lab results/tests. It’s not like Evelyn Wood speed reading right in front of her (that’s a joke for Gen-Xers). If you’ve been in the military, you know it can take eons to get an appointment at a veteran’s hospital and there’s not much you can do about it. But for the rest of us, it’s totally unacceptable to wait months for an appointment, especially if you’re in excruciating pain. 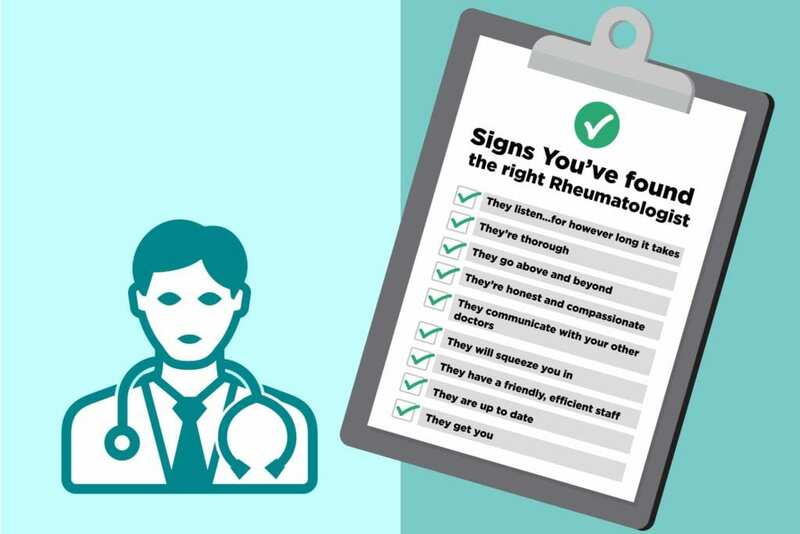 A good rheumatologist’s office will find time for you. The receptionist, the nurses, the lab technicians, and everyone in your rheumatologist’s office will feel like family after you’ve seeing them for years. (Hopefully, it’s not a dysfunctional family.) The staff at my doctor’s office helps make my visits as pleasant as possible. I look forward to seeing Magda at the reception desk; she always makes sure I have enough parking validation. Selma draws blood out of my thin-skinned hand like such a pro that it doesn’t even hurt anymore. And Arliz always gets me a pillow for my throbbing feet while I get my three-hour infusion. They run the office like a well-oiled machine. How do you know if your doctor is aware of the most recent advances in RA treatment? “All doctors are required to keep up with continuing medical education, the latest literature, and the newest drugs,” says Dr. Blazer, though she adds that physicians affiliated with academic medical centers tend to have more rigorous standards for continuing education. “I like that my doctor is up on all things current,” says DeWitt. According to an article in the Harvard Business Review, sharing a cultural or racial background with your physician can “help promote communication and trust.” Since 58 percent of doctors are white and, according to a UCLA study, only 9 percent of academic medical practices have procedures for connecting patients to LGBTQ-competent physicians, it can be difficult for minorities and gay folks to find doctors they feel the most comfortable with. Not saying that you should only see doctors who are exactly like you, but it could help. Unfortunately it’s nearly impossible. I can’t even find a stat that says how many LGBTQ doctors there are. But I did find a stat that says 30 percent of sexual minority medical students remain in the closet for fear of discrimination. However, this brings me back to points one and four. Even if your doctor has a different background from you, being compassionate and a good listener can go a long way. Especially if you’re a woman. Research shows that 70 percent of people with chronic pain are female, and yet there can be a real disparity in how they are treated. Research indicates women’s pain is more likely to be ascribed to emotional rather than physical causes. When men and women present with similar symptoms, women are more likely to be prescribed sedatives over pain medication. The gender bias is real but you really don’t have to deal with it. If you feel like your rheumatologist (or any doctor) isn’t taking your pain or other symptoms seriously, move on to someone who will. “It’s definitely true that women feel less heard in the doctor’s office,” Dr. Blazer confirms. You’re not a guinea pig; you’re a human being, so you shouldn’t be treated like a faceless cadaver by your rheumatologist. Stacy Nystrom experienced this at her last appointment. “I’ve been talking Plaquenil for a little over a year, and my dose increased a few months ago, which has helped,” she explains. “But I have a new insurance plan for 2019 and now it’s costing me almost $100 per month. My rheumatologist’s recommendation? ‘If you can’t afford it, stop taking it.’ What? That’s all you can come up with? I was so irritated and anxious.” Thank you, next. Make sure you understand how your practice uses physicians versus other care providers such as physician’s assistants or nurses. It’s perfectly fine to have different kinds of providers on your health care team, but you should know in what circumstances you will tend to see which experts. When you’re chronically ill, you want to feel like you’re getting the absolute best care possible. “It is impossible to get anyone on the phone at my rheumatologist’s office,” says Michelle Montcalm. “Every time I call, it goes straight to voice mail. Often, my calls are not returned or at best, the receptionist calls back two to three days later. Very frustrating!” If you always get the runaround on the phone, experience long waits to see the doctor, and get overall major ’tude, find a new practice. This is your health. You can’t afford to mess around with that!